Symbol for cytidine 5'-monophosphate (secondarily, for any cytidine monophosphate). Abbreviation for cytidine 5'-monophosphate (secondarily, any cytidine monophosphate). Any disease that affects the heart muscle, diminishing cardiac performance. Cardiomyopathy caused by years of heavy alcohol abuse. 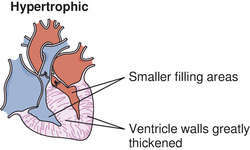 Affected patients have enlarged hearts and left ventricular failure. Abstinence from alcohol may halt or reverse the course of the illness in some people. Cardiomyopathy associated with enlargement of the left ventricle of the heart and congestive heart failure. Although patients may be asymptomatic for many years, they commonly report shortness of breath (particularly on exertion), fatigue, atypical chest pain (at rest and after meals), orthopnea, dizziness, and other symptoms of congestive heart failure after the heart muscle markedly enlarges. An S4 and a harsh crescendo-decrescendo systolic murmur, best heard at the left lower sternal border, may be present. Ventricular arrhythmias are common and may result in palpitations, syncope, or sudden death. Drug therapies include beta blocking and calcium channel blocking drugs (such as verapamil) to slow heart rate, control arrhythmias, and reduce myocardial oxygen demand. Anticoagulants and antiarrhythmic agents are also occasionally used. For patients with marked enlargement of the ventricular septum and high outflow tract pressure gradients (> 50 mm Hg), surgical removal of the enlarged muscle or ablation often produces favorable improvements in exercise tolerance and breathing. Strenuous physical exercise should be discouraged because it may produce breathlessness, presyncope, or frank loss of consciousness. If applicable, the patient should be encouraged to lose weight, stop smoking, and limit alcohol intake. An implanted cardioverter/defibrillator (ICD) may be required. The patient should be advised to report symptoms of chest pain, prolonged dyspnea, or syncope promptly. First-degree relatives of those affected should be referred for evaluation. Cardiomyopathy of occult or uncertain cause, possibly due to viral infections, unrecognized toxic exposures, or a genetic predisposition, but not to ischemia, hypothyroidism, hypertension, valvular disease, or alcohol abuse. General supportive therapy includes rest, weight control, abstinence from tobacco, and moderate exercise at a level that does not cause symptoms. A salt-restricted diet is recommended. Therapy includes the use of vasodilators, such as ACE inhibitors, and diuretics like furosemide. Anticoagulants are important to prevent thrombus formation. IDC is a principal indication for cardiac transplant. Enlargement of heart muscle resulting from long-standing or severe hypertension or aortic stenosis. Like all other forms of cardiomyopathy, the end result is heart failure. Dilated cardiomyopathy occurring either in the last month of pregnancy or in the six months after delivery. Its cause is unknown, but it occurs more often in older and multiparous women. Cardiomyopathy associated with lack of flexibility of the ventricular walls. Common causes include amyloidosis, hemochromatosis, sarcoidosis, and other diseases in which the heart is infiltrated by foreign material or scarred. Any cardiomyopathy in which the cause is either known or associated with a well-defined systemic disease. Included are cardiomyopathies associated with inflammation, toxic chemicals, metabolic abnormalities, and inherited muscle disorders. Cardiac remodeling and dysfunction that results from a chronically increased heart rate, usually a supraventricular arrhythmia. It is treated with medications such as beta blockers that slow the heart rate. A frequently ordered cluster of lab tests, comprising measurements of serum electrolytes (sodium, potassium, chloride, and calcium), renal function (blood urea nitrogen [BUN] and creatinine), acid-base balance (bicarbonate), liver functions, and glucose. The test is obtained by drawing a blood sample from a peripheral vein or, in critical care, from a central vein. Its brands include PR Newswire--the world's leading corporate news distribution service--and CMP, the media and exhibition group serving professionals and enthusiasts in the U.
Hyperactivity in CMP and PPS most often appears to serve the needs or expectations of others. This is primarily for the high-volume production of the company's new acidic and non-acidic copper barrier slurries, used in the CMP process of advanced low-k dielectric devices, as well as slurries for STI applications. Entrepix's CMP FastForward services further supports a Fab-Light or IDM+ business model. Through its market-leading portfolio of trusted information brands in the technology, healthcare and lifestyles industries, CMP Media has earned the confidence of more professionals and enthusiasts in these fields than any other media company. It is expected that SVTI and CMP would further cooperate in developing, conducting and hosting mutually beneficial training and educational projects and facilitate faculty and trainer exchange between the two organizations. Our 300mm CMP systems provide a winning combination of advanced technology and productivity that spans the entire semiconductor industry, from foundries to IDMs, including the vast majority of CMP systems used for 90nm and below," said Dr. Awards will be presented at the second annual awards gala held on April 4, 2006, at the Fairmont Hotel San Jose during CMP Media's Embedded Systems Conference Silicon Valley, at the San Jose Convention Center. CMP is a process for polishing and smoothing uneven surfaces of wafers (silicon oxide layer, interlayer insulation film, wiring metal layer, etc. We are very pleased to work with CMP Media on what is certain to be original, compelling, and valuable programming at our debut event," states TIA President Matthew J.
Rohm and Haas Electronic Materials, CMP Technologies, a leader and innovator in chemical mechanical planarization (CMP) technology for the global semiconductor industry, broke ground today for its Asia Pacific Manufacturing and Technical Center at the Hsinchu Science Park, Chunan satellite campus in Taiwan. PHOENIX -- Rohm and Haas Electronic Materials, CMP Technologies, a leader and innovator in chemical mechanical planarization (CMP) technology for the global semiconductor industry, today named Cliff Chen to the position of plant manager at its Asia Pacific Manufacturing and Technical Center in the Hsinchu Science Park, Chunan satellite in Taiwan.